Take a peek at these upcoming conferences! as well as the upcoming sessions. Detailed descriptions of each conference are shared here. Are you inspired?You can be!!! continue reading "Come and Be Revived!" Teach me to love, just like a child. Remind me every day to smile. To trust you as I take each step. Erase old wounds and past regrets. and trust you’ll supply all of my needs. Show me how to schedule my day. To learn from you and to always pray. Let me hunger for spiritual growth. Not gossip or words to speak in boast. Teach me forgiveness when I am offended. Responding in love…all hate will be ended. For mercy and grace are gifts we receive. If we only open our hearts and believe. 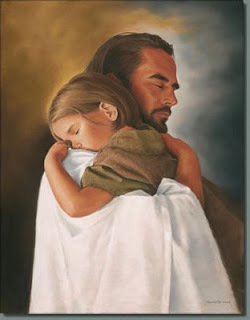 A reflection of Jesus, my Savior, God’s son. continue reading "Teach Me To Love"
Most people assume WWJD is the acronym for "What would Jesus do?" But the initials really might stand for "What Would Jesus Drive?" One theory is that Jesus would tool around in an old Plymouth because the Bible says, "God drove Adam and Eve out of the Garden of Eden in a Fury." In Psalm 83, the Almighty clearly owns a Pontiac and a Geo. 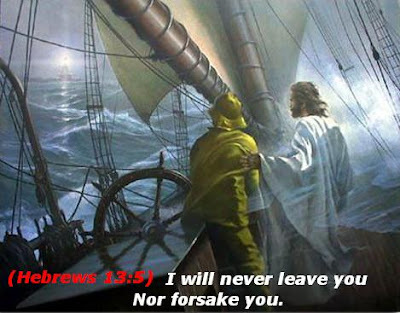 The passage urges the Lord to "pursue your enemies with your Tempest and terrify them with your Storm." Possibly God favors Dodge pickup trucks because Moses' followers are warned not to go up a mountain "until the Ram's horn sounds a long blast." Meanwhile, Moses rode a British motorcycle, as evidenced by a Bible passage declaring that "the roar of Moses' Triumph is heard in the hills." Joshua no doubt drove a Triumph with an aftermarket slip-on muffler because: "Joshua's Triumph was heard throughout the land." And, following the Master's lead, the Apostles car pooled in, you got it, a Honda: "The Apostles were in one Accord." * As seen in firstIMPRESSIONS - archived copies are available. 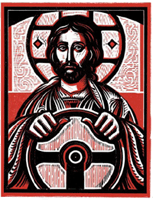 continue reading "What Would Jesus Drive?" "Self-Control vs. Holy Spirit Control"
LIVE Free Christian WebClass!! Discover how to develop true intimacy with God...Join in from home! Nearly 100 Believers have RSVP'd for this webinar already! If you want a seat at this POWER-packed teaching, sign up as soon as you can! P.S. - Ameerah will also be giving more information about the Fruit of the Spirit Course that is upcoming - don't miss it! Experience the Great Exchange: Gods peace for your anxiety. His joy for your depression. His faith for your fear. continue reading "Self-Control vs. Holy Spirit Control"
The Easter Webcast will include almost 2 weeks of incredible messages from a group of amazing Christian women! Come hear Bobbye Brooks & Tonilee Adamson, Jennifer Kennedy Dean, Dr. gail hayes, Karol ladd, Sarah Goebel, Linda Goldfarb, Jody Capehart, Maxine Marsolini, Thelma Wells, Linda Evans Shepherd, Joanna Faillace and Shell Washam. *starts March 30th, Easter Sunday ~ a new video every day! Be sure to let your friends know. continue reading "All Things New!" 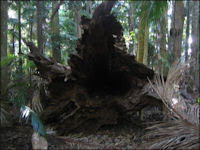 A four-hundred-year-old tree crashed to the forest floor. Over the centuries it had been struck by lightning fourteen times, braved great windstorms, and even defied an earthquake. In the end, however, it was killed by little beetles. Boring under the bark, they chewed away its mighty fibers until the giant of the forest lay broken on the ground. Little things can either make us or break us. A little lie, a little theft, a little laziness, a little neglect, a little drink a little too often, a little sarcasm, a little denial here and a little there ... bit by bit we can add them all together and eventually hurt or destroy our relationships, our physical and/or mental health, and our walk with God. On the other hand, a little smile, a little deed of kindness, a little encouraging word, a little thoughtful gift, a little phone call, a little bit of love given a lot of times every day can add up to a whole lot of sunshine that we can spread wherever we are and go, and in so doing encourage others, enhance our relationships, improve our physical and mental health, and please the heart of God. What 'little things' are you doing? and He'll never let me go! will protect me from the storm! which will stand against the tide! and hold tightly to His hand! for my heavenly Father is my source! He's the God of all creation! Christian Audio has done it again! Check out this great audio book that they are offering to you as a free gift this month! Offer is only available in March 2009. Send this post to all your friends. Discipline is such a necesary trait in the life of a believer. In order for your character to become more like Jesus, you need to spend time with Him. As you spend more time with Him, you will become more like Jesus. Be deliberate in your walk with Christ! 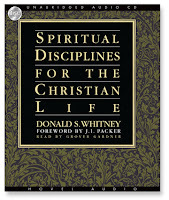 In order to receive this free book offer, you need to enter the download format of Spiritual Disciplines for the Christian Life to your cart and then enter coupon code MAR2009 when prompted during checkout. Go get your free gift; it will change your life! continue reading "Spiritual Disciplines for the Christian Life"
Is There a Word From God For Me Today? The song service is finished. The sermon begins. During the first three sentences, expectant faces look toward the preacher. A single mother sighs, praying her children will let her make it through the sermon, maybe even listen. An older man in failing health turns up his hearing aid. Frustrated and angry with diminishing strength and energy, he searches to make sense of his losses. A closet homosexual sits saturated in guilt. A high school sophomore listens with an MTV-conditioned attention span. She is not trained to listen long. A successful business person caught in the depths of depression hopes for an alternative to suicide. A Bible class teacher dealing with major failure clings to faith by a fingernail. A married couple, sitting together in the pew but hardly speaking at home, hopes for renewal of lost affection. A frustrated parent of an angry teen looks for confidence. A widow’s eyes fill with tears as her hand touches the empty seat beside her. A cancer patient needs a reason to suffer through another chemo session. The mate is desperate for strength to persevere. A contractor, competing with kickbacks and cheats, wonders if his ethics are antiquated. A nurse, exhausted from a twelve-hour-pressure-filled shift, hopes for renewal. A lonely soul hopes for connection with others. New Christians listen to build faith. Long-time members hope for revival from spiritual lethargy. Debaters want a convincing argument. Condemners want a reason to feel superior. Tired church volunteers long for a boost. Frazzled church staffers need a shot in the arm. Elders need power to persevere through the pressure. Deacons need to be uplifted. The confused seek wisdom. The guilty seek forgiveness. The sad seek help. The mad seek release. The glad seek rejoicing. Who dares to rise to preach in the face of such need? Who can meet such a multiplicity of expectations? God can. Only God can. God speaks through the preacher’s faltering words, stiff outlines, and overused illustrations. God speaks through his words, his tears, his personality, his humor, his gestures, his spirit. God uses unworthy vessels to anoint hearts, persuade minds, lift spirits, comfort pain, and enlighten understanding. The power in preaching is not the preacher. It is God. God speaking through a man, gives a beautiful gift in a plain brown wrapper. God has a word for you. Shhhhh. Listen. © 2002, Greg Cummings. Used by permission. Title: "In a Plain Brown Wrapper"
continue reading "Is There a Word From God For Me Today?"